Does Luke Jermay’s Cartomancy Tarot Reading Expansion Pack Copyright Notice Prohibit Practically ALL Rights to Perform? A Review of the Copyright Notice and The General Debate Surrounding People who Withold Rights! BUYING MENTALISM EFFECTS AND YOU ARE NOT ALLOWED TO USE THEM? Take a look at it and then Answer me this..
What is the point of buying something if you are not legally allowed to perform it for ticketed paying audiences which is prohibited by the below? Also how exactly are we these days as performers actually 100% able to guarantee that someone won’t catch video footage of us and put it onto YouTube, again this is prohibited by the below? Copyright 2015 (C) Luke Jermay, All Rights Reserved. All legal owners in possession of an original copy of this manuscript have the right to perform these effects, presentations and methods in non-recorded, non-broadcast, live first person, non-ticketed, nontheatrical performance settings only. They are not permitted to teach, sell, resell, lecture, manufacture, translate or otherwise use, demonstrate, display or perform the contents. The only authorised use is in the context of live, first person performance. All broadcast, narrowcast, internet, intranet, You Tube and any and all other uses are strictly withheld by the author and permission for all other uses by anyone other than the author must be obtained in writing first. Thank You. This copyright is the intellectual property of Michael Weber and is used here with his express permission. If that is the same Copyright Notice that appears in the front of the Actual Main “Cartomancy” package he is selling then What The F**K.
Basically you can’t Professionally perform it without seeking permission first.. If this same Copyright Notice is at the front of the main Playing Card “Cartomancy” release as I suspect it will be, then its even more what the F**K? I’ve just checked Luke’s Sales Page and nowhere does it state there atre any restrictions on performing the material in his “Cartomancy” package. Therefore one could argue in Law that anyone who bought “Cartomancy” can perform it anywhere in any manner and broadcast on youtube and TV if they so desired without fear of any legal comeback on the basis that prior to purchase they were not made aware of these restrictions on performance. And if it is just a case that the restrictions apply to doing it with Tarot, then I can’t see that standing up in court either if someone choose to perform it on TV etc as the advert for the original package does not make people aware prior to purchase of any restrictions. I’ll tell you this for a fact, WHEN YOU BUY STUFF OFF ME YOU GET RIGHTS TO PERFORM IT ANYTIME ANYPLACE ANYWHERE FOR ANYONE IN ANY MANNER YOU SO DESIRE SO LONG AS YOU DON’T GIVE THE SECRET AWAY..
Oh and without giving anything away about what is in the Tarot Expansion Pack that Luke Has just sent out to everyone I can however state 100% FOR SURE that the methods revealed in my recent release “The Psychic Secrets of Alex-Leroy” for doing Accurate and Mind Blowing Tarot Readings on both a one to one basis and also from the Stage as per Luke’s “Cartomancy” release advertises are way more useful in the real world. 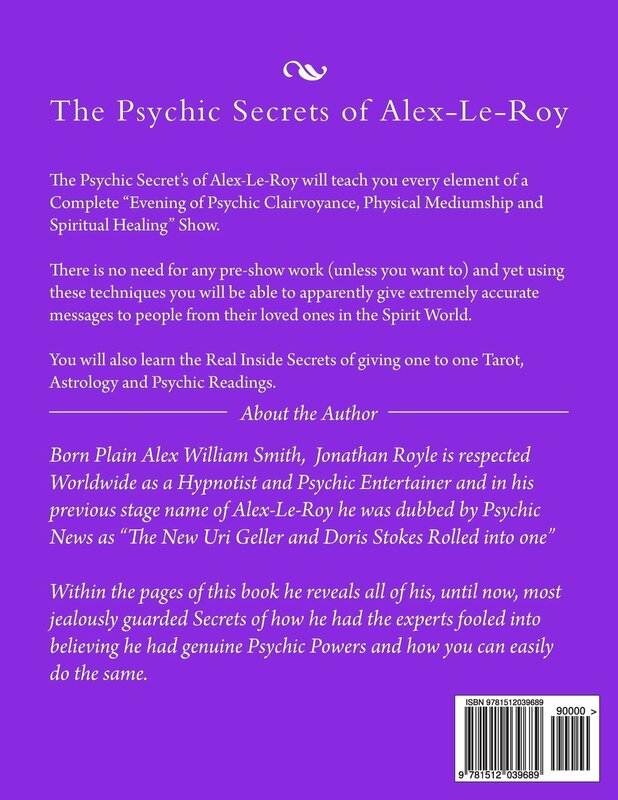 As I say its not my place to give anything away about Lukes methods or routine, but I can say this with my Methods, Routines and Approaches from “The Psychic Secrets of Alex-Leroy” you can give Extremely Accurate and Mind Blowing Readings with either Playing Cards or Tarot Cards from the stage (or one to one) with any normal deck of Tarot or Playing cards. 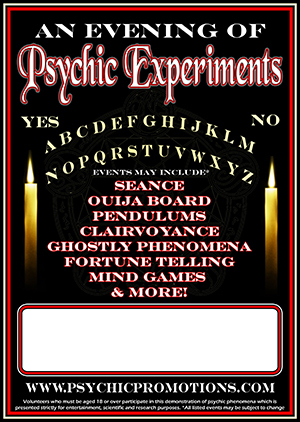 All props used in my “Cartomancy” Readings are 100% EXAMINABLE and indeed could be borrowed. 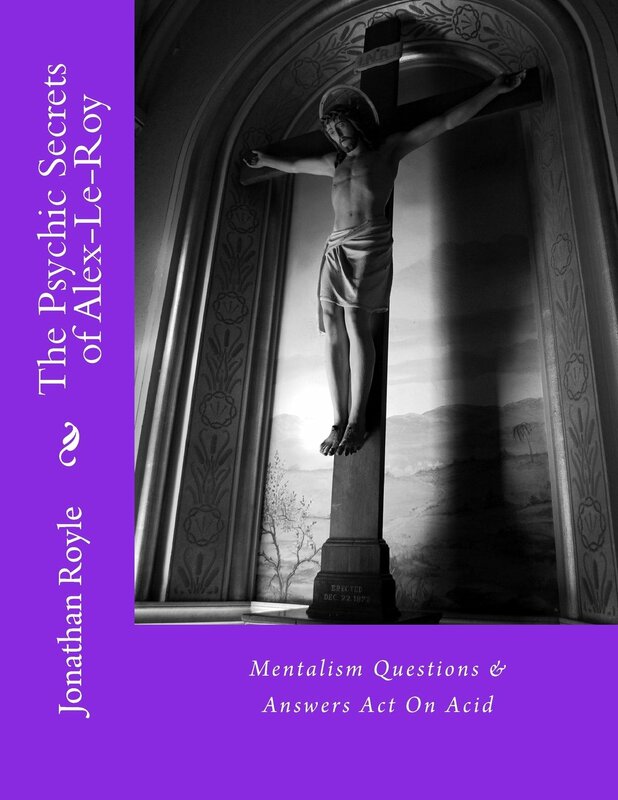 But what is further, using my methods YOU DO NOT NEED ANY TAROT OR PLAYING CARDS AT ALL, you can instead easily do a complete Propless Mentalism “Questions and Answers” Act. I don’t care if its a theatrical venue or not..
Do you think it is right that Magical and Mentalism Creators try to part you with your money and then stop you performing the routines/tricks/effects in certain contexts, environments or for certain audiences such as TV…???? And even if you think it is OK for them to with-hold certain performance rights, surely you would agree with me (as does the Law of the land I am sure) that purchasers should be CLEARLY made aware of any such restrictions BEFORE purchase so that their purchase is an agreement to them, as opposed to the first thing they discover of them is opening the book, box or package etc AFTER they have parted with their money!? ?